According to the World Health Organization, in 2006 at least 171 million people were diagnosed as suffering from diabetes. Diabetes in one of the top five most significant diseases and, in combination with the other two ‘developing countries’ diseases, high blood pressure and heart problems can be proven lethal. In just the United States alone, 20.8 million people were diagnosed with diabetes in 2005, while another 6.2 million people were undiagnosed and another 41 million people were in pre-diabetic status. These scary numbers are the reality of our modern world. Diabetes, especially Type II, is the combination of heritable situation and the life style that includes a bad diet and little exercise. We must understand that diabetes, Type, I and II, is chronic and there's no cure - the only defence is the lifestyle of the diabetic. I’m not a doctor myself, so you'll have to find the doctors and institutions to give you all the help and information you may need, plus the internet can also provide forums for diabetics suffering from both types; they can give you some help but most of all support. As I said, I’m not a doctor and I'm certainly not pretending to be one, on the contrary I am a diabetic and I found out my situation in 1994. All the signs were there I just didn’t see them or never had the right information to even recognise them. Not that there was lack of information, there was plenty available in hospitals and doctor’s surgeries. It was just nowhere around, nobody had told me that being forty, having a lifestyle full of stress, an uncontrolled diet and no exercise was asking for problems. For over two years I had all the symptoms by the book, I was constantly thirsty and hungry, I was gaining weight quickly and, at the same, I was then losing it just as fast. However, I always had the excuse of being too busy all the time. I started having problems with my eyes and kept thinking I must check them… when I’m not too busy. I always had something more important to do, but then two years after I found myself in hospital bed following a cardiac episode and a diabetes waiting in the corner. Since then my life has changed. It had to change by force and over a decade later it still has its ups and downs. For many of these ups and downs I am to blame because I had to learn new tricks and that was not always easy – especially for an old dog like me. It would have been definitely easier and much simpler if I had the right information at the right time. I’m not going to tell you the differences between diabetes I and II, but there are many and they are both dangerous, especially if we don’t take the right precautions. As I said, there is no cure for diabetes but there is definitely management that can lead to a normal life - don’t forget that one of the strong symptoms in diabetes is physiological, such as depression and manias. In the case of diabetes II, doctors practice an operation called gastric bypass surgery that treats patients with 80-100% severely obese diabetes, but again you must ask a doctor, who can give you better information. 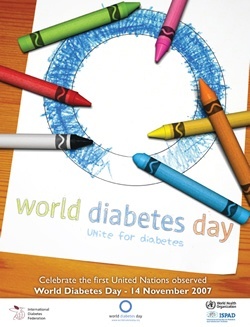 November 14th is World Diabetes Day and a good chance to find some more information about one of the worst contemporary diseases.